ZSpace provides a virtual reality environment for immersive learning. The zSpace system includes unique, interactive design software and a high-definition 3D monitor with full resolution images rendered for each eye. 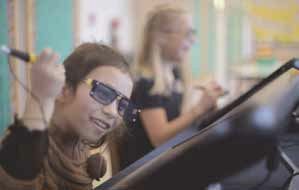 It uses sensors to track the viewing angle of the user, a PC workstation to run the specialized software, polarized passive 3D eyewear, and applications for K-12 students. The program is also ideal for medical schools and corporate training, and it provides a development platform for creating new applications and integrating new input devices. Ease of Use: After an initial configuration process of about 10 minutes, the system loads and functions in a manner very similar to using software for an interactive whiteboard. The zSpace comes with easy-to-follow instructions and set-up procedures. Creative Use of Technology: Although watching the video on the Web site is a good introduction to zSpace, it shows only about 1/5 of the potential zSpace has for bringing full, experiential learning to your students. It is not until you put on the 3D glasses, use the stylus, and get into the proverbial “driver’s seat” that you realize this is learning at its full potential, with all senses involved. When you can pick up a beating heart, feel the pulse through the stylus in your hand, and look inside each ventricle to observe the heart valve mechanisms at work—that is when you are taken from the reality that surrounds you into the augmented reality that zSpace can provide. Suitability for Use in a School Environment: The zSpace system works best in a lab situation. A typical lab consists of 12 zSpace STEM stations (immersive and interactive systems, including computers). The system comes with two zView augmented reality presentation packages, teacher professional development, and zSpace learning applications. Not only does zSpace fit smoothly into any STEM curriculum, but it will amplify any lesson in these areas to a redefining level. zSpace is constantly adding new models to its library. Currently it offers: solar system models; anatomy models; technology models, including engines, vehicles, and motor models; etymology, microbiology, and zoology models; industrial models; electronics/appliances and tool models; and systems models. Models are divided into two categories: segmented and non-segmented. • Virtual Learning: zSpace provides a platform for augmented, virtual, and 3D technology. This is the direction that all schools should be heading in terms of bringing experiential learning into the hands of all students. • Quick Set-up: zSpace is quick to set up and is perfect for schools trying to augment or begin a meaningful STEM curriculum. • Vast Library: zSpace already has a plethora of models and learning applications. However, zSpace is committed to developing its library further and into more areas of interest. As zSpace grows, so will your library of presentation packages. OVERALL RATING: zSpace has so many possibilities for the classroom—and it is just getting started. The only feature that would make this less appropriate for school settings is the price. However, a school might purchase one of these systems and it could be shared among teachers for their curriculum maps throughout the year.